When I decided to buy my first-ever Mac last year, I was beyond excited. Unfortunately, I hit a quick roadblock. You see, I spend half of my time using laptops as makeshift desktop computers; when I am home, I prefer to use a large monitor, keyboard, and mouse. For the best experience, I would need some sort of dock, and Apple just doesn't make one. 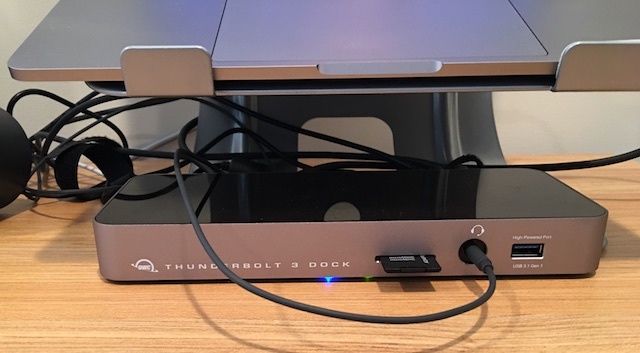 Luckily, Apple's wise use of Thunderbolt 3 and USB-C meant it would be easy to obtain a docking solution. I quickly learned, however, that many solutions on the market were terrible. USB-C based solutions caused the most issues, such as various sleep/wake errors and disconnecting USB storage drives. Even some Thunderbolt 3-based products had similar issues. Thankfully, I finally found a quality TB3 dock. Made by OWC, it features 13 "ports," allowing you to convert a MacBook Pro into a legitimate desktop alternative. Before I get to the dock, let me tell you what I want/need to connect to it. Like I said, I enjoy connecting a mouse, keyboard, and large monitor. Since I bought a MacBook Pro with only 256GB of storage, I sometimes need to connect external USB drives. Other USB devices I use at home include a webcam and Blu-ray burner. The MacBook Pro does not have an SD card slot, which I occasionally need for transferring photos and videos from my camera. Since I use my Apple laptop for music, I also want to connect desktop speakers. 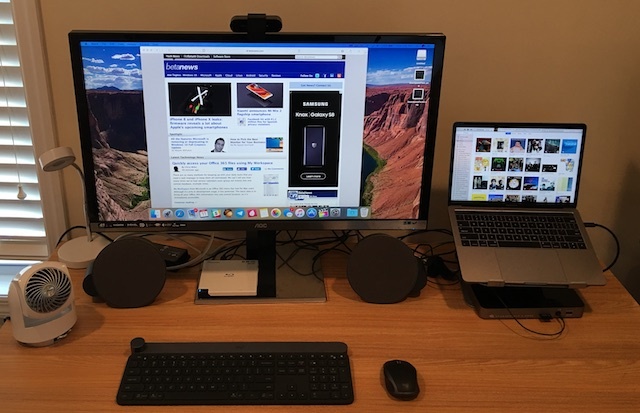 I am happy to say the OWC Thunderbolt 3 Dock meets all of my needs -- and then some. For video, there is a mini DisplayPort connection. This is a smart move, as you can easily use that to connect to both HDMI or full-size DisplayPort with a dongle or specialized cable. In my case, I have a mini DisplayPort to female DisplayPort dongle, which I then connect to my 4K monitor with a standard cable. The dock is able to output 4K at 60Hz and it looks amazing. There are two Thunderbolt 3 ports. One port connects to the laptop for connectivity and charging (with the included cable), while the other can be used for TB3 or USB-C devices -- if you have any. This port can also be used for video with the appropriate dongle, so you can connect yet another monitor if you need to -- including 4K. It can also be used instead of the mini DisplayPort. On the rear, there are four USB Type-A ports, which I use for a wireless mouse receiver, optical drive, Logitech webcam, and external hard disk drive. My keyboard connects using Bluetooth. There is a single USB port on the front, which can be used for connecting flash drives or charging devices. Also on the front, is a full-sized SD card reader. This is fast and reliable -- I have used it countless times to transfer videos and photos to my MacBook Pro for editing. While there isn't a micro SD reader, you can use those smaller cards with a converter. The front of the dock also has a 3.5mm audio jack, which can be used for headphones, headsets, or speakers. This is where I encounter my only real complaint. Look, I understand the front is a good place if you want to connect headphones, but for speakers, not so much. You see, I have to run a cable from the front of the dock to the speakers, which doesn't look very elegant. There is an optical output on the rear, but my speakers do not use that. I would prefer if the 3.5mm audio port was on the rear, but understandably, some people would disagree. Besides the optical output, there are two other ports I don't use. One is the gigabit Ethernet port, and the other is FireWire 800. The hardwired Ethernet port is something I would use if I had it in my office, but for now, I only connect using Wi-Fi. It's nice to know Ethernet is there, however, just in case my situation changes. The FireWire port will never be used by me, and I am guessing, almost no one else either. While some folks may have some legacy FireWire devices, I think it could have been omitted here. With that said, it really doesn't hurt anything. So, do I recommend the OWC Thunderbolt 3 Dock? Without hesitation, yes. While $299 may seem like a lot of money, it works absolutely brilliantly -- it is worth the premium to have everything just function without any headaches. Don't forget, it will charge your Apple laptop too, meaning you can always leave the normal charger in your bag, limiting the possibility of forgetting it at home. Ultimately, if you own a MacBook Pro with Thunderbolt 3, and you want to use it as a desktop, this is the dock to get. Ready to buy it? It can be had here in both silver and space gray. On another note, if you are interested in the laptop stand that I am using in the photos, it can be had here for a mere $19.99.